Saturday morning saw accredited journalists and photographers visit Race Control for a media breakfast and the 8th Credit Suisse Historic Racing Forum. Entertaining a packed house of press and invited guests alike with their lively debate around the theme ‘Closed Cockpit versus Single-Seaters: The Path to Motorsport Glory’ were British racing legend Sir Stirling Moss OBE, Grand Prix and Le Mans winner Jochen Mass, and five-time Le Mans 24 Hours champion Derek Bell MBE. They were joined at Race Control by three-time Indianapolis 500 winner Dario Franchitti MBE, Le Mans winner and former Formula 1 racer David Brabham, and TV presenter and World Sportscar Championship race winner Alain de Cadenet. Sir Stirling Moss recalled his early years in 500cc Formula 3 racing and hillclimbing and the way in which early success triggered a rapid rise up the motorsport ranks, while Jochen Mass remembered the days when he raced in F1, the World Sportscar Championship, and the European Touring Car championship in the same season, highlighting the impossible logistics, politics, and financial pressure of doing so today. Le Mans legend Derek Bell talked fondly about how as an aspiring single-seater racer he got a lucky break in a privateer Ferrari prototype that kick-started his love affair with Le Mans and the World Sportscar Championship. Joining the panelists for the second year, Dario Franchitti entertained with stories of his touring car tie-up with Mercedes that would eventually lead to huge success in the US and explained how the complicated network of expensive junior racing categories makes a young driver’s progression choice so difficult. Credit Suisse ambassador Alain de Cadenet regaled the audience with how he chose the sportscar racing route over F1 when setting up his own team and commissioning the design and build of his own car. Finally, David Brabham explained how much pressure there was as the son of a three-time World Champion when he was starting out, adding invaluable insight into the differences between career choices that drivers made and/or had made for them in the past and those of today. Motorsport writer and broadcaster Henry Hope-Frost once again moderated the Forum, which was followed by a short photo-call with all panelists. The Forum was just one of the engaging media opportunities available to accredited press throughout the weekend. Doors to the exclusive trackside venue were also opened to VIP guests and accredited media on Friday, giving them the chance to take advantage of the excellent vantage point from the Credit Suisse Race Control roof terrace. As well as throughout the day, the terrace was open during the inaugural Kinrara Trophy race, which drew the day-one festivities to a close. On Sunday morning, media and motorsport fans gathered on the sun-drenched lawn in front of Race Control as Credit Suisse complemented Goodwood’s tribute to Sir Jack Brabham. Goodwood owner Lord March and Karsten Le Blanc, Credit Suisse UK, presented Sir Jack’s son David with a special piece of artwork, in the presence of members of the Brabham family. The framed commemorative diorama, hand-built for the occasion by Graham & Leigh, honored the 50th anniversary of Sir Jack becoming the only driver in Formula 1 history to win the World Championship in a car bearing his own name. The beautiful gift featured a model of the car in which he won – the Brabham BT19 – in addition to an eye-catching sculpture of the Monza circuit where the historic moment took place in 1966. Feature image (top of page): Sir Stirling Moss OBE discussing modern F1 racing with Alain de Cadenet and Dario Franchitti MBE. 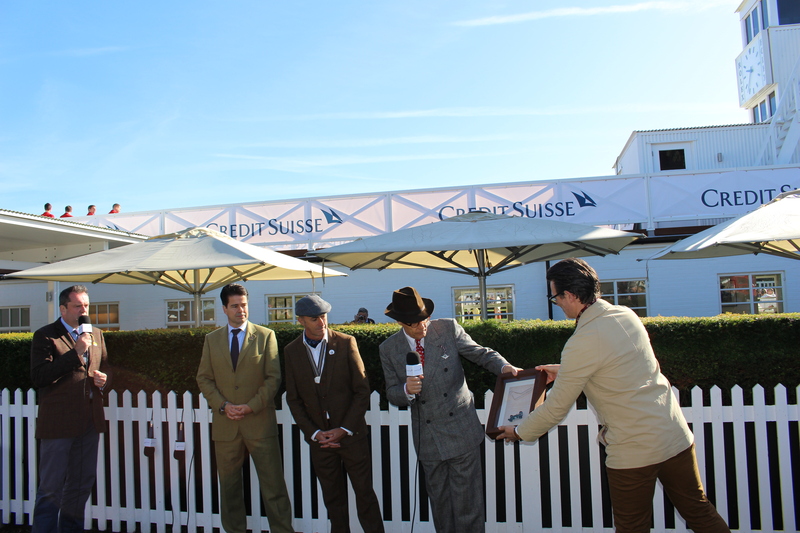 Goodwood Revival Cricket match – Lord March’s team wins!